Review: Tomb Raider, an wonderful introduction to Lara Croft. Movies based on video games rarely live up to the hype. It’s not just about keeping the original story; acting, writing, and direction all play a part as well. Tomb Raider (based on the 2013 reboot of the games) manages to hit all those points for one enjoyable movie that does justice to Lara Croft. We are introduced to Lara, a young woman in London who is still grieving over the loss of her father (played by Dominic West) who went missing seven years prior. She’s not an adventurer just yet, but she has all the best qualities of one: sarcastic, driven, and incredibly intelligent. Alicia Vikander plays Lara so well; her qualities are genuine, and you can see the Lara we have come to know and love in her. Lara’s motivation to visit Yamatai Island shifts from what it was in the game. Here she visits the island with a boat captain, Lu Ren (played by Daniel Wu) to search for her father who disappeared in search of Queen Himiko’s tomb. As in the games, her father means everything to her; he shaped her personality and drives to strive for better. 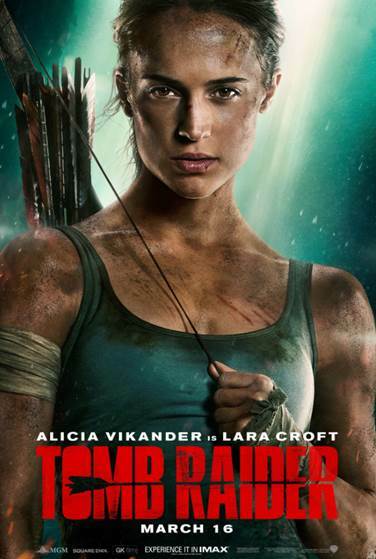 While on the island, she meets Mathias Vogel (played by Walton Goggins) who remains the perfect villain, pushing Lara to her limits and threatening to eliminate any bit of hope she has on the way. Once on the island, secrets are unraveled as Lara faces enemy after enemy to find out the truth. Each trial she’s put through slowly begins to shape her into the adventurer we know so well. While this is mostly a solo mission for her, I feel it’s necessary to keep the focus on Lara. You can’t go into this expecting it to be the 2013 Tomb Raider game that sets down Lara’s origins. The storyline is similar but opens up to other possibilities that work better on screen. It’s not a dry action-only film; it has appropriate humor that captures the different sides of each character, and especially Lara. The special effects really bring Yamatai to life, from the lush beauty of the island, to the the foreboding nature of Queen Himiko’s tomb. With a solid story, fun cameos and engaging performers, we see Lara sent off with an encouraging start on her return to the big screen. You can catch Tomb Raider this weekend as it hits theaters March 16th. I’m Singing the Praises of This Episode (But Don’t Worry, Not Out Loud) #Lucifer S3E17 Review: Let the Pinhead Sing!